It will be an action packed Tiger Christmas! The first poster of YRF’s mega action entertainer Tiger Zinda Hai is out and by the look of it it is going to be a non stop action adventure. Directed by Ali Abbas Zafar, this first look showcases that Tiger (Salman Khan) and Zoya (Katrina Kaif) are set to return with a bang in their gun-totting avatars this Christmas! 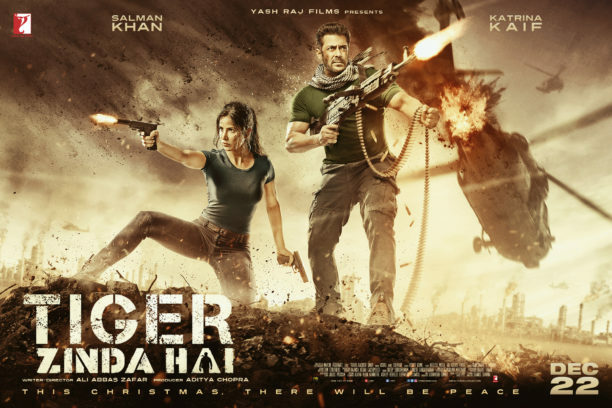 Tiger and Zoya are seen pulling off an insane action sequence in the poster as they wield their guns trying to take down forces of their nemesis all to keep the peace. Shot across multiple countries around the globe, the super-hit pair of Salman Khan and Katrina Kaif return in this high-octane action thriller that is set to release on December 22. We certainly can’t wait to sit on the edge of our seats once again!